The spate of earthquakes, floods and cyclones that have hit New Zealand in recent years won’t scare off reinsurers, according to S&P Global Ratings. Acknowledging the uptick in natural disasters, the credit ratings agency says there are no indications reinsurers are looking to exit the region. Rather, insurers are continuing to benefit from “ample capacity at favourable pricing and terms and conditions, due to the continuing soft state of the global reinsurance market”. In a new report, Sound Economy And Modest Price Rises Are Helping New Zealand P&C Insurance Sector Stand Firm, S&P notes a number of general insurers exceeded their budged catastrophe allowances in the last financial year, with the majority of claims stemming from the November 14 Kaikoura earthquake. IAG, in its financial results to June 30 for example, noted the disaster cost it AU$120 million after reinsurance. Suncorp’s results told a similar story. All up S&P says the Kaikoura quake is expected to cost the industry NZ$1.9 billion. Yet with around 50% of residential building claims related to the event assessed by July 31, and the majority of claimants expected to receive offers by the end the year, it says claims are being settled much quicker than was the case after the 2010/11 Canterbury quakes. This is largely due to private insurers handling claims on behalf of EQC. This “increases confidence in reserving and capital”. S&P also notes the resilience of the market. It recognises the solid underwriting results reported by insurers in the last financial year. IAG’s New Zealand division’s gross written premiums (GWP) grew by 4.3% for example, while Suncorp’s grew by 7.9%. “In contrast with recent years, premium growth was reasonable, especially at the retail level, with price increases and volume gains in both the home and motor vehicle lines,” S&P says. As previously reported by interest.co.nz, S&P recognises rates have increased as insurers have responded to higher motor claims costs caused by more cars being on the roads and higher repair costs. 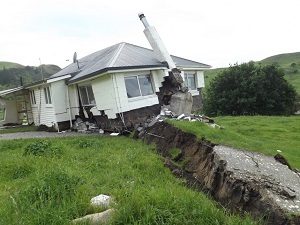 Likewise, the Kaikoura quake has seen them increase the cost of property insurance. “Nevertheless, we expect competition to remain intense, with new entrants and offshore participants making their presence felt,” it says. This S&P graph shows P&C (property and casualty) insurers have been performing reasonably well. Finally, S&P says the review of the EQC Act is looking positive for the industry. A draft reform bill is expected later this year or early next, with changes likely to be implemented in 2020. S&P says the expectation that policyholders will lodge their claims with their private insurers, rather than EQC first (as has been done in Kaikoura) “should assist in improving the transparency and efficiency of the claims process”. S&P goes on to say: “The suggestion that the EQC no longer provide contents insurance (currently capped at NZ$20,000) should increase the market size and therefore growth opportunities for private insurers. “Moreover, the extent of insurers' exposure to earthquake risk is lessened with the proposal to increase the EQC building claims coverage cap to NZ$150,000 from NZ$100,000. 'it (S&P) says claims are being settled much quicker than was the case after the 2010/11 Canterbury quakes. Yes, partly. But the demise of open ended house replacement cover and tightening of cover per event reinstatement clauses has also allowed insurers to negotiate total loss settlements more easily and quickly. Yes, boy did they get stung on the total replacement settlements. I guess until we can self insure we are stuck with respect insurers. True - good point thanks Middleman. Plus there was only one Kaikoura event (so far) - ChCh had multiple events spread over years.